ArtsBuild will exhibit the artwork of local professional artist Iantha Newton. Ms. Newton was born in London, England and resides in Chattanooga. She is a past recipient (2017 and 2018) of Equity in the Arts, a grants program created by ArtsBuild in partnership with Benwood Foundation to support projects led by local Black and Latino artists. Ms. Newton said, “The Equity in the Arts grant afforded me the mental liberty in the form of an interval of time and physical space to utilize an explosively vibrant palette to produce 30 paintings in a more contemporary application, or what is termed a more modern ‘open’ impressionism.” 15 of those paintings (acrylic and oil on canvas) are featured in the exhibit at ArtsBuild. Ms. Newton and her husband Charlie Newton established a nonprofit organization called SPLASH, which offers free art workshops and classes, after school and on weekends, for at-risk youth on Chattanooga’s west side. 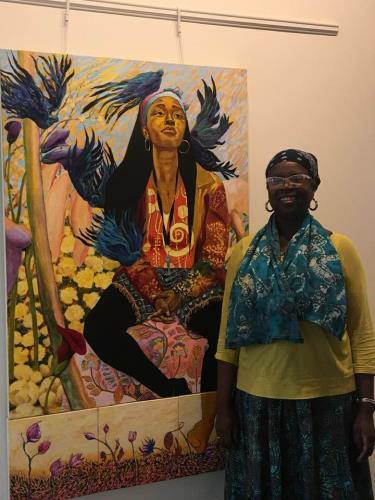 Ms. Newton's artwork will be on display through the end of March 2019 in the Arts Building, Second Floor, 301 E. 11th St. Chattanooga, Tn. 37403, during office hours, Monday through Friday between 9 a.m. and 4:30 p.m.